Fill your empty containers with water and put them into the freezer. When you are ready to use the frozen ice, give 5-10 minutes to allow the ice to melt a little which will make it easier to remove. 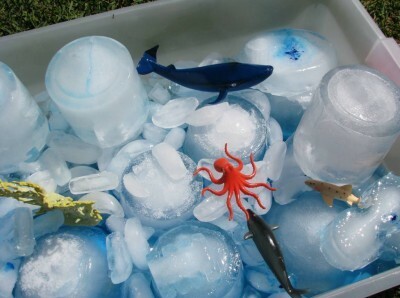 This is a sensory activity for toddlers that involves playing with ice, water and a selection of themed props, these can be tailored to your child’s individual interest such as Sea creatures. Your child will start to question and understand how the process of freezing changes things, this will develop your child’s understanding of the world. As you fill the empty containers with water talk about shape and measurements to develop mathematical language by using words such as full, empty, large and small. Place a few drops of food colouring into a small jug of water and pour it over the ice to create a coloured ice affect.